Royal Revolution by Katy Perry is a floral fragrance for women. Blackthorn, pomegranate and pink freesia are fused with explosive jasmine petals, orange flower and sandalwood, before drying on a base of vanilla orchid, leather and musk. The video advert campaign tells the story of a cartoon Katy Perry dressed as a medieval queen; she wins the battle and wears Royal Revolution, “the scent of victory”. This is the second limited edition of the American singer’s bestseller Killer Queen. Housed in a gem-shaped bottle inspired by blue diamonds, you can find Royal Revolution in EDP or perfumed shower gel. 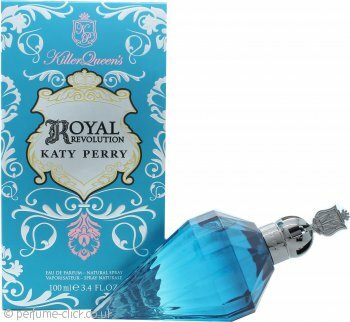 Royal Revolution was launched by Katy Perry in 2014. Katy Perry Royal Revolution Eau de Parfum 50ml SpraySmells beautiful ! Katy Perry Royal Revolution Eau de Parfum 50ml SprayTreat for myself! I was busy buying Xmas pressies for everyone and thought I needed a little treat! I love this perfume. I usually avoid the celeb perfumes as they are overpowering and plain yuk but this is lovely.... so much he kids are trying to pinch it! It has appeal for all ages. Delivery was super quick and price was so cheap.... I will be buying the bigger bottle especially if my teenage girls do get their hands on this! Katy Perry Royal Revolution Eau de Parfum 100ml SprayGood service and price! Have ordered twice and always has brilliant prices and services. Been looking for Katy Perry perfume for my sister, but it has always been very expensive. Found perfume click and they had very good price. Free parcel tracking is included with all delivery options. The estimated delivery date for your order will be shown on the Shopping Basket page and your Order Confirmation Email. UK Express Delivery is not a guaranteed next working day service but over 98% of these parcels are delivered on the next working day after dispatch when sent to mainland UK addresses (excluding Scottish Highlands). For Express Delivery & Special Delivery, your order must be placed before 4pm on a working day to be dispatched that day. Orders placed on a non-working day or after 4pm will be dispatched on the next working day. This service is provided by DPD. They will send you an email or SMS message on the morning of the delivery with a 1 hour delivery time estimate. The delivery days and times that are available to you can be viewed by selecting the Named Day delivery option on the shopping basket page when placing your order. Express, Special & Named Day Delivery is not currently available for all of our products. These delivery options will be made available to you on the shopping basket page if they are available for the products you have selected. For Standard and Express deliveries in the UK you have the option to collect your order from your choice of over 10,500 Post Office branches. With many branches open late in the evening and at weekends, it really is a very convenient option. Just choose the 'Collection Point' option on the shopping basket page, then search through and select from all of your local Post Office branches whilst viewing their opening times and location on a map. Once your parcel is available to collect you will receive a notification via Email and SMS (if you choose to provide us with your mobile phone number). NOTE: You may be required to sign for your delivery. Your products will be held at your local sorting office for 7 days if no-body is present to sign for them. If you do not collect within 7 days the products are returned to us and you will be liable for cost of re-delivery.